Sunshine Rooms offers repairs and complete line of replacement parts for your solarium, conservatory or greenhouse. Over time your sunroom might need a little maintenance, just like any other part of your home. We can help! If you’ve got broken glass, seals need replaced or any other repair to your sunny living space just let us know and we’ll be happy to arrange for repairs. Or, if you prefer, we can send the part you need to make the repairs yourself. We can also assist with upgrades like high performance glass, operable windows, doors, HVAC equipment, shades and more. Please use the form below to request a part or repair assistance. 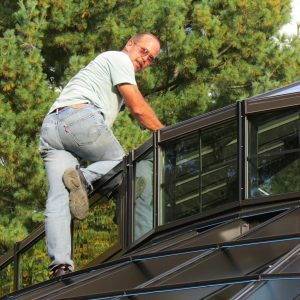 Solarium, conservatory and greenhouse repairs are performed by our glazing installation crew. Our crews have years of experience installing glazed structures, with both dual pane glass and polycarbonate panels. Crews are available across the continental United States.